Our lodgings will provide you the privacy and comfort of a modern vacation home at a reasonable price, ideal for relaxing and unwinding together with your loved ones. The hotel is situated within walking distance of the famous Alona Beach, where you can jump in for a quick dip or enjoy a romantic evening walk and dinner along the shore. Reward yourself now with a welcome break from the hustle and bustle of city life. You deserve your own top-class room that’s easy on the pocket. 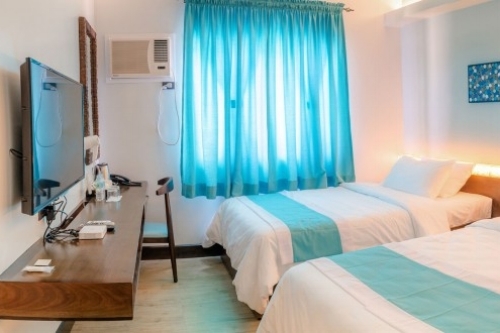 We here at Twin Tides Panglao offer you a luxurious experience everyone can enjoy, and that’s a guarantee. 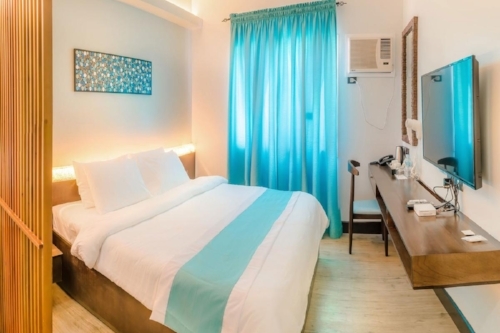 Our well-designed yet inexpensive rooms are capable of satisfying all types of patrons. All who will pass through our doors will surely find a guestroom that will satisfy their needs. We offer all the usual amenities that a traveller requires, and our customer service is second to none. Guests who choose to stay in our hotel laud our competitive rates, and find that the quality of our accommodations exceeds expectations. Jumpstart your day of fun-filled activities with a complimentary breakfast, courtesy of our highly-competent cook. Savor the scent of baking dough and fresh coffee as you wake up every morning at Twin Tides Panglao. Our bread is baked on-site, and our varied espresso-based coffee will surely prep you for the morning’s adventure. We also offer cold and refreshing fresh fruit shakes that are perfect for the country’s tropical climate.